Has there been a more hyped collaboration album in recent memory than Love This Giant? 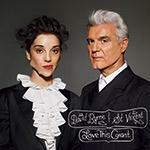 Post-punk progenitor, avant-rockist, idiosyncratic genius David Byrne has partnered with Annie Clark (stage name St. Vincent), one of the best guitarists of this era on the heels of what many say is the best album of last year. Beyond a few seemingly inconsequential similarities—both are New Yorkers, both are musical auteurs, both are beloved by a cult-like legion of followers, it’s hard to think that the angry, introspective guitar-virtuoso would have much in common with the man who sang about buildings and food and introduced African rhythms to punk. Still, the hype for Love This Giant crossed-over to my parents’ generation, and I am happy to say, the two have crafted an album worthy of their names, stylistically bold and also a whole lot of fun. To enjoy this album, you only have to do one thing: Forget everything you think you know about how it will sound. I don’t care if you’re the biggest Talking Heads fan in the world, the biggest St. Vincent fan in the world, or could sing every word to every song either one of these artists ever penned right now. Love This Giant does not sound like what you think it does. As soon as the horns on opener Who kick in, you might suspect that. In a few more tracks, the fact that you probably can’t recall more than one guitar line should make it clear. For the most part, Byrne and Clark trade off lead vocals, but while it’s easy to call each song either a “David Byrne song” or a “St. Vincent song,” what makes the collaboration so great is that each has a hidden presence, a beautiful complement to the other’s song. Whether it’s St. Vincent’s floating, repetitive vocal line on Who or The One Who Broke Your Heart becoming the most fun song this side of And She Was, it’s hard to come away arguing that one or the other was a bigger part of the album, even if you may prefer the songs that Byrne sings to the one’s that St. Vincent does, or vice-versa. Somehow, these two have found ways to have individual spotlights throughout a collaboration without ever provoking the thought that this isn’t really collaborative. The album takes a few tracks to get rolling, and Weekend In The Dust, with Clark’s skittish vocalsand a muted drum track giving way to a forgettable horn part will probably make you raise a red flag. But the bridge brings things back up to where they were on Who, and then she brings a quiet but integral harmony to Byrne’s defeated-optimist cries on Dinner For Two and takes the album into the sublime with Ice Age. In other words, it becomes clear quite quickly that everything will be okay. Clark embraces her smooth, velvety Marry Me voice instead of her bitter and ferocious bite of Actor (save for Lightning, where she sounds much angrier), and it keeps Love This Giant tonally controlled, matching nicely against a Byrne who sounds more rejuvenated and youthful than he has in several years. It would be succinct and mostly true to say that Byrne’s idiosyncratic style and composition shape the album, while St. Vincent’s no-reservations approach carries it. The best songs are the ones that sound like David Byrne but aren’t sung by him. For the most part, Love This Giant is about searching for lost love, and when the horn parts hit and Byrne embraces the syncopated percussion, the album maintains a somber mood while also giving you something you can maybe, if you try really hard, almost dance to. It’s the same reason that these songs being almost-solo works so well; they dance steps and the harmonies are reminders of a better time. It’s quite fitting that the closest thing to a true duet here is Outside of Space and Time, the final track, where after trading monologues for so long, alternately literary and witty (Byrne) and self-patronizing but introspective (Clark), only occasionally being on the same page, they finally meet. It’s hard to deny the quality of these songs. I Am An Ape broods with mood, Optimist feels like a sweet reprise to better days, Lazarus feels like two artists who would not let the other not push himself/herself. But for the most part, experimentation and ambition are quite low, with the use of horns in and of itself substituting for any continuous greatness that the album achieves occasionally. But again, these are, quite simply, great songs. They are fun, they are emotional, and no two sound alike. For St. Vincent, it is proof that she will continue to push herself forward (she was the one who suggested brass) in exciting new directions. For Byrne, it further cements his versatility and influence. Time will tell just how essential and prescient a note (or footnote) Love This Giant will be, but for now, I’ll be about as optimistic as they are.